The “trick” to being psychic is very simple: you need to be able to hear and listen to your inner voice clearly in order to receive the information that is being offered to you via your psychic senses. Learning to meditate teaches you how to quiet your thoughts and center your focus and concentration so that your inner voice can speak clearly to you—and so that you are ready to listen. In addition, the practice of meditation teaches you how to enter the alpha brain wave consciousness purposefully. In the alpha brain state, your focus and awareness is on your internal experiences—feelings, intuitions, and creative thought, because your electrical brain wave patterns are moving at a slower frequency or rhythm. Scientists and physicians who study the human brain have discovered that it generally produces brain waves in four basic classifications: Beta, our normal waking consciousness state when we are focused on tasks and memorization, exhibits brain wave frequencies between 12 to 38 Hz; alpha, the brain wave state humans experience during meditation and times of relaxed creativity with a frequency between 8 to 13 Hz; theta, the brain wave state we experience in between waking and sleep when we are just coming out of our dreams with frequencies between 4 to 8 Hz; and delta, when the brain is in a deep sleep or unconscious mode with frequencies below 4 Hz. Hz is the abbreviation for Hertz, which is a unit of frequency measuring the change in state or cycle of a sound wave, alternating current, or other cyclical waveform, in this case the electromagnetic activity of the brain, of one cycle per second. Being in the relaxed alpha brain wave mode of consciousness allows you to have a clear bridge of communication between the right hemisphere of the brain—the place of creativity and psychic sensitivity—and the left hemisphere of the brain—the place of logic, linear thinking, and perceptions. Meditation and centering allows for a clear channel of communication between the two halves of the brain, which will bring you clarity, insight, and understanding of the psychic information you receive. Now, when I speak about your “inner voice,” keep in mind that you may get your psychic information in a different way than “hearing” it inside your head. Sometimes you may just get a flash of information and suddenly simply “know” something. You may have a vision that could be a complete scenario, or it may be simply a symbol or a face that you will need to work with as you interpret its meaning further. You may hear a quiet voice in your mind which gives you information. You may receive psychic information via your dreams. You may use a psychic tool such as the tarot or I Ching and interpret the cards or the throw of the coins. You may use a scrying mirror or crystal ball to psychically “see” scenes, images, symbols, colors, or numbers. You might employ a pendulum and use it to gain answers by the direction that it moves. There are many ways to obtain psychic impressions, intuit answers, and receive specific information that will help yourself or others. When I use the term “inner voice,” I am talking about accessing that part of yourself that receives, interprets, and recounts information not obtained from your everyday material world or physical senses. It doesn’t matter the method by which you get the information or how it may be presented to you. The important point is that you pay attention and take note of the information that you receive. Your inner voice is like any other part of you—the more you use it, the stronger and more skilled it gets at giving you information. The less you use it or pay attention to it, the more it atrophies and weakens. Everybody is a born psychic. You, me, everyone. It’s a natural ability and a part of what it means to be human. Some people are born with such a strong inner voice that they can’t help but hear it—these people, if not trained, may not be able to understand what they are getting, but the voice is strong. If they don’t understand why they are having these visions or why they can feel emotions and thoughts so strongly from others, they might work hard to shut it down, but it will always be there, ready to communicate again. Learning to hear your inner voice is like learning to play an instrument, becoming skilled at a sport, or mastering anything. What you have to do is acknowledge the desire and then practice the discipline. And then practice some more. The more you practice anything, the more skilled you become. It’s exactly the same with developing and honing your innate, human psychic skills. The ability to meditate is essential to clearly hearing your inner voice. If you cannot quiet your mind, relax, center yourself, and focus, you will find that trying to access that inner voice and listen to what it has to tell you will be a frustrating experience. Sure, you’ll still be able to get the occasional psychic “hit,” but it will come sporadically, and I bet it will come when you are daydreaming or in that half-asleep, relaxed alpha brain state before you begin to drift into sleep at night or as you wake up in the morning. You will have a psychic experience at times when you are inadvertently in a slightly altered, quieter state of mind. If you want to use your psychic skills dependably and in a conscious way, you’ll learn the basics of meditation. Sometimes when people hear the word “meditation,” they have the mistaken notion that they have to commit to a lengthy process in order to achieve a mental state of complete, total sublimation and control of the conscious mind. Not at all. No, you don’t have to chant mantras or be able to keep your mind absolutely blank for ten minutes or more. I’m talking about creating a meditative state of mind wherein you are calm, relaxed, and receptive. A state where you can focus on just one thing for a few minutes at a time, allowing your quiet thoughts to examine that one thing, consider it, and explore it. As you do this, your breathing will naturally slow, your body will relax, and you will feel at great ease. This thing that you are focusing on can be an image, a question, a feeling, a sensation, or a concept. 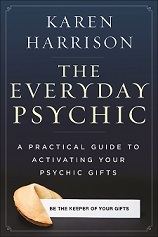 Karen Harrison has been involved with magick, the psychic arts, and occultism since early childhood. She earned a Master of Herbology from the Emerson College of Herbology in Montreal, and has worked as a professional psychic since she was seventeen years old. A third generation psychic, she has taught thousands of people how to open their own intuition and use that insight to enrich their lives. Copyright © 2012 The Everyday Psychic by Karen Harrison Reprinted with permission from Red Wheel/Weiser LLC Available wherever books or ebooks are sold or from www.redwheelweiser.com or 1-800-423-7087.